A Venezuela-Colombia border crossing between San Antonio del Tachira and Cucuta. Below, Joe Emersberger takes down a recent example of the kind of crude propaganda that the corporate media has been running in its campaign against Venezuela. A slightly longer version of this article was first published at Fairness and Accuracy In Reporting. First, Colombia’s population of internally displaced people is about 7 million and has consistently been neck and neck with Syria’s. According to the United Nations High Commissioner for Refugees, as of mid-2016, Colombia is also the Latin American country that the most number of refugees living outside its borders: over 300,000, mainly in Venezuela and Ecuador. Forero and his editors picked the wrong country to compare with Syria. Second, Greece and Italy do not share a border with Syria, nor do the Balkans as they are generally defined. Colombia and Venezuela, by contrast, share a very long border. Forero’s comparison excludes states that border Syria. Three of those bordering states — Lebanon, Jordan and Turkey — collectively absorbed 4.4 million Syrian refugees by 2016. Five years after war broke out in Syria, Turkey alone took in almost 3 million. It is very important to expand on the first point. Colombia is a humanitarian and human rights disaster, and has been for decades, in very large part due to its close alliance with the United States. Thanks to Wikileaks, we know that US officials privately acknowledged estimates that hundreds of thousands of people were murdered by right-wing paramilitaries, and that the killings have nearly wiped out some indigenous groups. Those genocidal paramilitaries have worked closely with the Colombian military that US President Donald Trump’s Chief of Staff John Kelly praised in 2014 as a “magnificent” US partner. Praise for Colombia’s government has also come from the liberal end of the US establishment, albeit with much more subtlety than from Kelly. In 2014, a New York Times editorial stated that “Colombia, Brazil and other Latin American countries should lead an effort to prevent Caracas from representing the region [on the UN Security Council] when it is fast becoming an embarrassment on the continent.” For NYT editors, Colombia is a regional good guy that must lead its neighbours in shunning Venezuela. Colombia’s current president, Juan Manuel Santos, was minister of Defence from 2006 to 2009. From 2002 to 2008, the Colombian military murdered about 3000 civilians, passing them off as slain rebels. The “conflict” has not exactly “ended” given that 170 leftist political leaders and activists were assassinated last year. Putting aside Forero’s epic distortions by omission regarding Colombia, what about his reporting about migration from Venezuela? 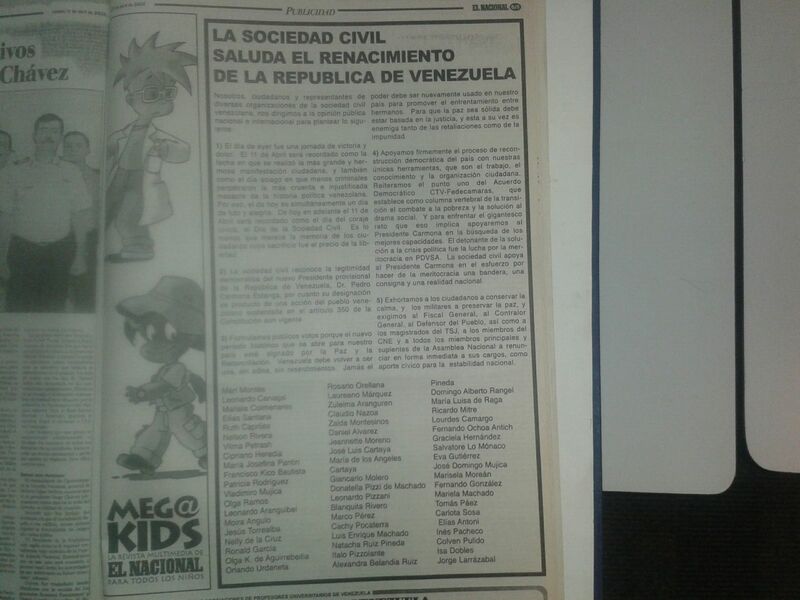 In April 2002, Paez signed his name to a quarter-page ad in the Venezuelan newspaper El Nacional that welcomed the dictatorship of Pedro Carmona, then head of Venezuela’s largest business federation, who was installed after a US-backed military coup briefly ousted the late President Hugo Chavez. The World Bank has compiled data over the years on the numbers of Venezuelan-born people living abroad. The numbers point to far smaller migrations than Paez has estimated. During the years Chavez was in office (1999–2013), the World Bank’s figures tell us that the number of Venezuelans living abroad rose by about 330,000. By 2013, Paez was estimating that about 1.3 million had left — about 1 million more than World Bank estimates. Would journalists ignore data published by the World Bank in favour of estimates by Paez if he were a staunch supporter of the Venezuelan government? The World Bank has not updated migration data past 2013, but there is no doubt there was a huge increase in migration from Venezuela since its economy entered into a very deep crisis starting in late 2014. According to a Colombian university study of Venezuelan migration to Colombia, it averaged about 47,000 a year from 2011–14, then rose to 80,000 a year in 2015–16. US government data show migration from Venezuela to the US rising from about 7000 a year before 2013 to 28,000 a year by 2015, including Venezuelans who have entered without authorisation. From 2000–13, the US was the destination for about 30% of Venezuelan-born people who left to live abroad, according to the World Bank figures. If the Colombian university study and US government data are accurate, then the US has been the destination for about 20% of Venezuelan migrants after 2013. That would mean about 140,000 Venezuelans a year were leaving to live abroad by 2016. That is not remotely comparable to the 5 million Syrians who fled the country in the first five years following the civil war — and that figure does not include more than a million a year who fled their homes inside Syria (the internally displaced). That Forero would even try to force this comparison into his article speaks volumes. It is not hard to guess why it was made, given that the US has bombed Syria regularly and has had Venezuela’s government in its crosshairs for almost two decades.